“Do not withhold good from those who deserve it, when it is in your power to act” (Proverbs 3:27 NIV). Every day God gives you little opportunities to show kindness to people around you. As he does, he’s watching to see if you’re going to be self-centered or if you’ll notice the people who need a word of encouragement or a pat on the back or an errand done for them or some other practical means of help. The Bible says, “Do not withhold good from those who deserve it, when it is in your power to act” (Proverbs 3:27 NIV). You won’t always have an opportunity to help. So when you do, take the Nike approach: Just do it! You probably have people in your life that you’ve thought about helping. You have the best intentions, but so far, you’ve done nothing. Why? We make excuses. One of the most prominent: “I’ll do it when things settle down.” Guess what? Things never will. If you’re going to do any good in your life, the time is now. The Bible says, “If you wait for perfect conditions, you will never get anything done” (Ecclesiastes 11:4 TLB). Do good now because we’re not guaranteed tomorrow. Jesus says, “All of us must quickly carry out the tasks assigned us by the one who sent me, for there is little time left before the night falls and all work comes to an end” (John 9:4 TLB). God has assigned tasks for all of us to do in our lives. And our lives are ticking away. Don’t wait for perfect conditions; every day, look for the opportunities God gives you to help and encourage others. What are some excuses you’ve may have heard for not doing good quickly? Can you describe a time when you “meant to” do good but waited and lost the opportunity? How is God asking you to do good for someone? What step can you take today to make that happen? Get the skills you need to succeed in life! Desire and determination simply aren’t enough to succeed in life. Success isn’t about working hard… It’s about working smart, God’s way. 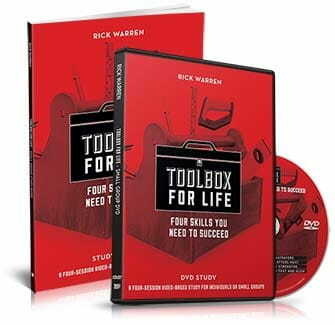 That’s what you’ll learn how to do with Pastor Rick’s Toolbox for Life Study Kit. We’ll send you the Toolbox for Life Study Kit as thanks for your gift to Daily Hope this month, so request your copy when you give below. We pray it helps you build the biblical skills you need for success! Originally published June 04, 2017.